Janelle In Real Life: lovely combo. Plaid and fur. What a lovely combo. I'm just so stoked to be layering fun things like this. Hooray for cooler weather! And layers! And boots and sweaters! All the fall things. And I'm extra happy that this non maternity top will button over my growing belly! It has a nice long fit, meaning I can make it wearable for even longer. There may be a bulging button or two, but I'll take it. Happy Thursday, my friends! Hope you have some fun plans of some kind this weekend. We have family in town (hooray!) and will party in our usual weekend fashion. Yay! Aw, I love this look on you! You look so chic and your bump is the perfect accessory! Thanks, girl! Making the bump look good is my biggest challenge these days, so I'm glad it worked here! Your vest is great girlie!! You look great! Love your vest! Thanks for linking up with us today! Lovely! I really like the blue plaid with the dark denim! I tried on a vest like that at HM, it looks really nice on you and spices up the outfit! Yes, I've seen the h&m one before! So cute! so stylish! i love the vest! You are such a cute pregnant lady! Love this look (maternity or not). I agree with you; I am so excited to be able to layer finally. Especially since I am pregnant as well. I have had my fair share of summer weather. Houston equals hot and humid. You look so cute in this cute outfit pregnant or not. Love it!!!! So glad for the link up. What a great look! I wish I could rock maternity jeans like that. Unfortunately, I have yet to find a pair that fits right so I'm living in dresses and leggings these days! Great look for you! Stopped by from Style Sessions. Thanks for stopping by my blog, you are the cutest pregnant girl! It gives me hope to see how stylish you are. I can't wait until my bump is as cute and noticeable as yours! Isn't it nice when our non-maternity clothes still work?! You look awesome, I love the plaid! 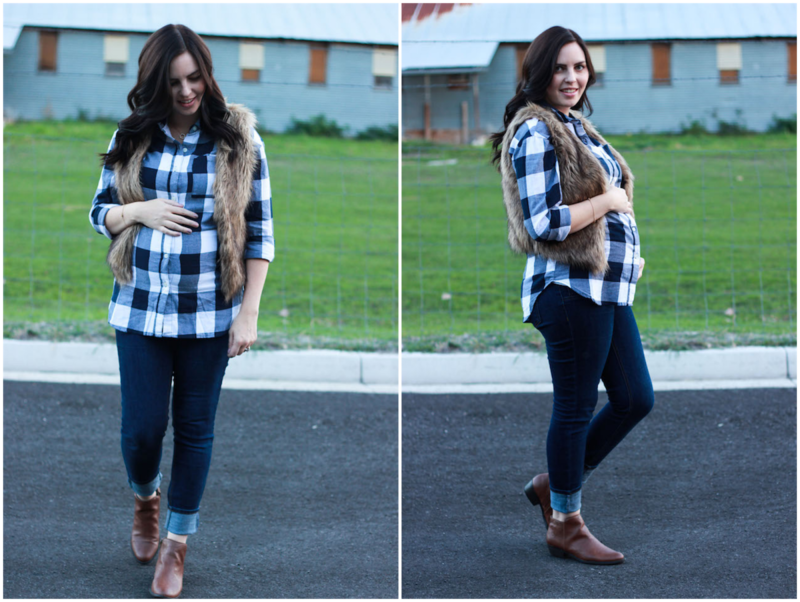 faux fur, plaid adn belly bump, i love it! !